The government has been partially shutdown for nearly a month, leaving TSA and immigration and Customs Enforcement (ICE) officers at O'Hare and Midway airports without pay for nearly two pay periods. Officers are facing dwindling bank accounts, affecting mortgage or rent payments, insurance and prescription coverage, utility bills, food for the families and more. "We're tightening our belts," said one TSA officer. "Tightening them a little bit more than normal now." 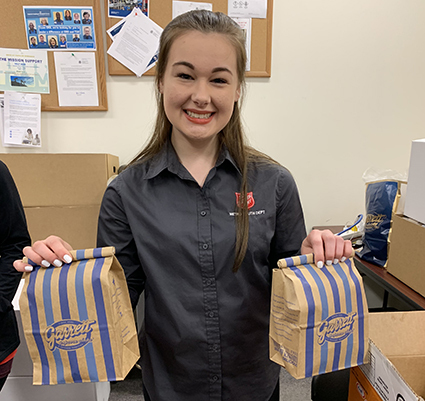 She was sitting in the break room at O'Hare's Terminal 2 enjoying a turkey sandwich, fruit and Garrett's popcorn. During the day, Salvation Army officers and volunteers met many TSA and ICE agents saying the same thing. "Most of the officers say their getting by OK, but they know a few others who could use some help," said Captain Michael Sjogren, Salvation Army officer at the Norridge Corps Community Center. He is serving in Terminal 5 with his daughter. "They're generally upbeat and hopeful. They are definitely grateful that we're here to give them some food and to listen." 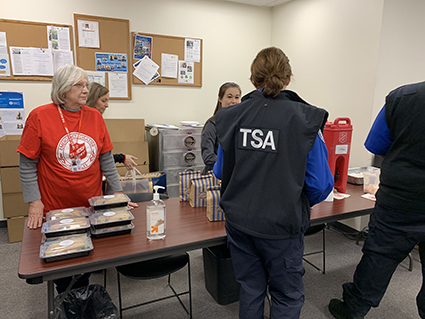 The Salvation Army Emergency Disaster Services program was activated to provide meals for TSA and ICE officers for the duration of the government shutdown. A TSA Transportation Security Manager at O'Hare Airport was joking with some agents who were on break and enjoying the treat that Garrett's Popcorn sent over - bags of the Chicago Mix. Despite the uncertainty, there is still time to stop for a laugh. "This is a tough time, but we have dedicated staff members," he said. "They're still showing up to work and signing up for extra shifts. And the support from the public has been so wonderful. A passenger brought some agents hamburgers. Chicago Police officers passed out coffee. And The Salvation Army is making sure we have a good meal to eat. This means my agents don't have to worry about a meal today or tomorrow. And that makes this whole situation a bit easier." Between O'Hare and Midway, the Army expects to feed approximately 1,400 TSA and ICE officers each day. In addition to providing meals, snacks, coffee and water, staff are also managing food donations from local businesses and airport vendors. "It is times like these that we really see the public pull together," said Major David Dalberg, Director of The Salvation Army Emergency Disaster Services in the Chicagoland area. "And it is a blessing for us to be able to stand beside these people and serve others. That is what The Salvation Army is called to do - serve. It is a privilege." To support these and other Salvation Army Emergency Disaster Services efforts, visit the EDS website.